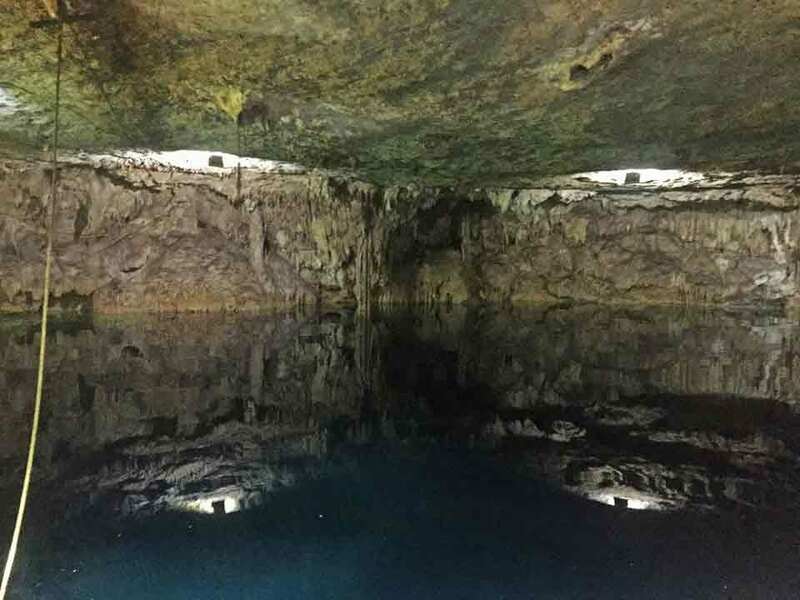 La Ruta de Los Cenotes in Puerto Morelos is the closest place where you can admire the spectacular cenotes if you are staying in one of the beautiful resorts of Cancun, or anywhere along the Riviera Maya. As a matter of fact, among the things to do in Riviera Maya, La Ruta de Los cenotes (the cenote route) is one of the most interesting. 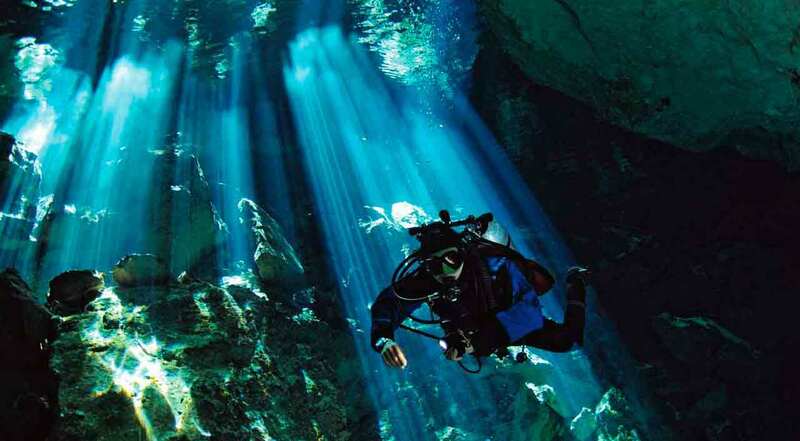 You can, in fact, visit more cenotes in one day in the entire region of Quintana Roo. Therefore I candidly suggest you should save one day for this trip if you are vacationing either in Cancun, Playa del Carmen or along the Riviera Maya. You can check on the below map to see the distances. La Ruta de Los cenotes is a beautiful well-paved 37km (about 20 miles) road through an untouched thick vegetation that goes from Puerto Morelos, a lovely fishing town situated about 35 km south of Cancun, to Leona Vicario, a nontouristic town located on the way to Merida. Along this road, you will find one after another on both sides, many beautiful cenotes of different type and shape. Many of them have been transformed in fully equipped adventure parks with all sorts of activities, like the zip line, quads, mountain bikes and so on or modern representation of Mayan rituals such as ceremonies or temazcal. They became part of organized tours for the short distance from the main hotels and the comfortable facilities. I am not really fond of this kind of activities as I believe the cenotes can be better enjoyed in the tranquility of nature, without much man-made structures and noises that are different from birds chirping and monkeys howling. However, tourism has become one of the main sources of income for those communities that own or manage the cenotes and they obviously try to make the best advantage of it. How to blame them? Despite the touristic exploitation, I am happy to say that they manage to conserve the beauty of those cenotes and you, nature lover like me, can still enjoy them fully and without spending so much time on the transportation. 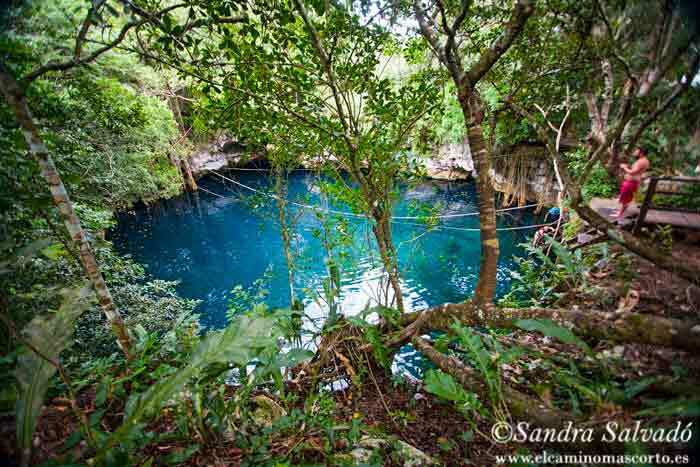 Here I tell you my favorite cenotes in the Ruta de Los cenotes. Besides having visited some of them, I am writing this guide with the precious help of my friend, great photographer and major expert of the Mayan land, Sandra Salvado’ and her beautiful blog El camino màs corto. If you know some Spanish you should go straight there and leave my site, and if you don’t know Spanish you should still check out her blog anyway just for the amazing pictures. Actually, you will find some of her pictures on this blog as well. Here is a map with all the cenotes you will find in the Ruta de cenote. You will see the map on a sign right at the beginning of the road in Puerto Morelos. Heritage of the Mayan culture the cenotes of Yucatan are deep underwater lakes that are filling with blessing the entire peninsula. The importance of the cenotes goes back to the Mayan times, the pre Hispanic population that inhabit this area. They used the cenotes not only as precious and unique sources of water provision but also sacred places for their religious ceremonies. 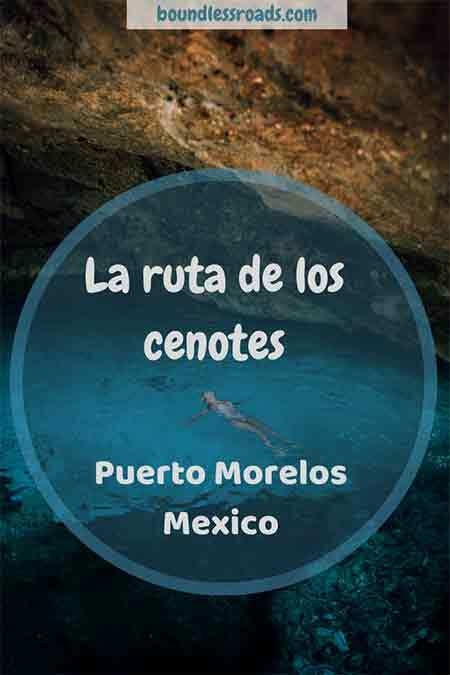 Just like the popular towns of Homun and Cuzamà in Yucatan, La Ruta de los cenotes in Puerto Morelos is another area where you can visit more cenotes in one day. 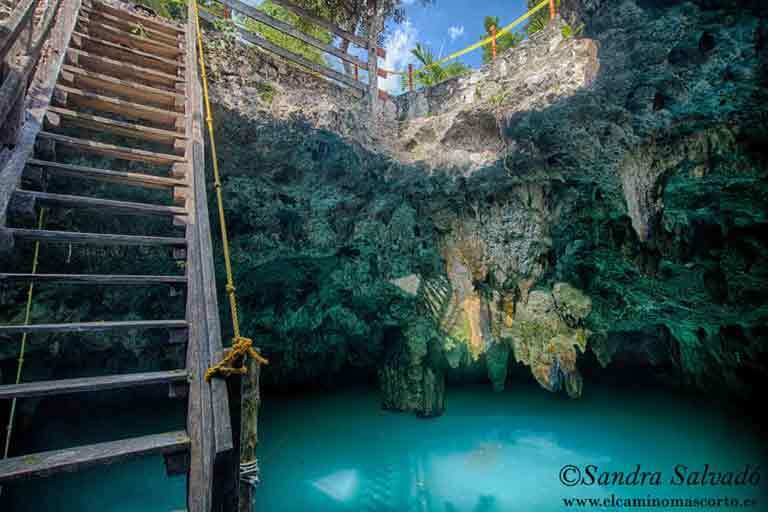 A huge open cenote with green emerald water, 65mt large and with a 6 mt platform for jumping. This cenote is the one I regret not having seen. It’s structured like a tunnel with 7 entrances ( 7 Bocas means 7 mouths in Spanish. And you can swim through the tunnel itself. Cenote kin ha. Unfortunately, you cannot see it properly from this picture taken by me with my cell phone. I just found hilarious the two lights reflecting on the water looking like eyes. In reality, the cenote is much more beautiful. This is one of my favorites and when I have a friend coming to visit I used to take them there. The company that runs it always work with big groups and offer quode tours in the jungle and a visit to another bigger open cenote. I never do that and always stick to Kin-ha. It’s a cave cenote you need to climb down some stairs or, if you are brave, jump from a trunk. If you like to chill there and enjoy the magic of the jungle they have drinks and some snacks and hammocks to lay down and relax. I suggest you should arrive early in the morning to avoid the crowds. This is my second favorite, it’s less known and more secluded, it’s located right before Kin-ha on a detour on our right. You will see a small sign. It’s a cave cenote as well, with wooden stairs to get to a platform. You can also jump if you wish. They also have bathrooms where you can also get change, but all very basic. Of course, there are more cenotes than the ones I have visited. Here is the list. 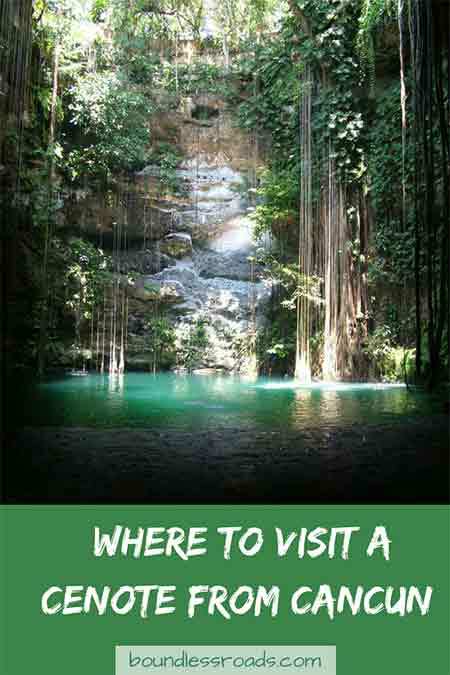 If you click on the name of the cenote you will be taken to my friend’s website with very detailed explanations. They are in Spanish but with google translator, you will definitely understand. For any question please do not hesitate to ask. 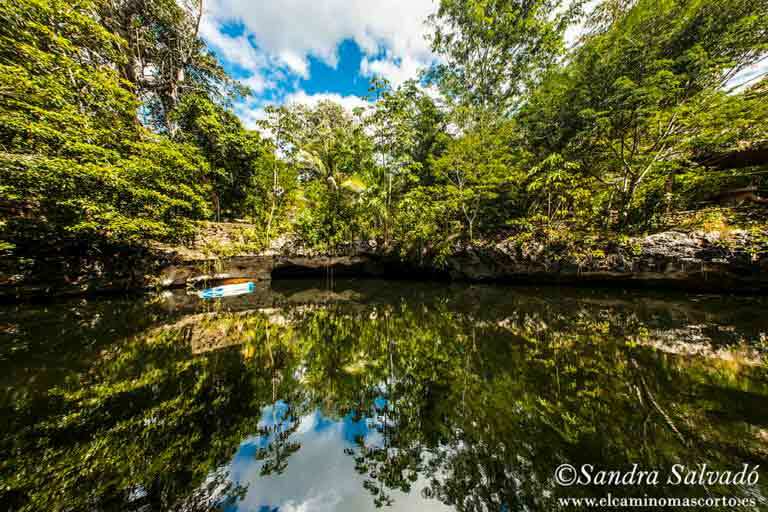 There are organized tours that would include one of these cenotes in the Ruta de Los Cenotes, but if I were you I would either rent a car or if you don’t feel comfortable you could go by taxi. If you contract a taxi for one day for 2 people it would cost you more or less like an organized tour but you will be on your own and can make your own personalized itinerary. From Cancun, you would take the carretera federal direction, Playa del Carmen. When you arrive in Puerto Morelos you have to make sure you drive up on the bridge but keep your right as if you were going in town. Past the bridge, before it ends, on your right you will see the entrance and the map (picture above). From Playa del Carmen, you will need to keep your right at the bridge in Puerto Morelos, and once you are at the roundabout below the bridge you make a U-turn as if you were to go back to Playa del Carmen, right after 200 mt, before the end of the bridge you will see the sign to turn right. There you are on La Ruta de Los cenotes. All the cenotes will be perfectly marked by big road signed. You cannot miss them. There are no public transportations that go to the cenotes however what you can do if you are coming either from Playa or Cancun is to take a bus from your city (playa del Carmen or Cancun or the minivan would stop all along the Carretera federal – main road-) to Puerto Morelos. the combi which are white minivan – they leave every few minutes as soon as they are full and they stop along the main road. Opening time: the entrance is normally from 8/830 am to 5 pm – open every day. 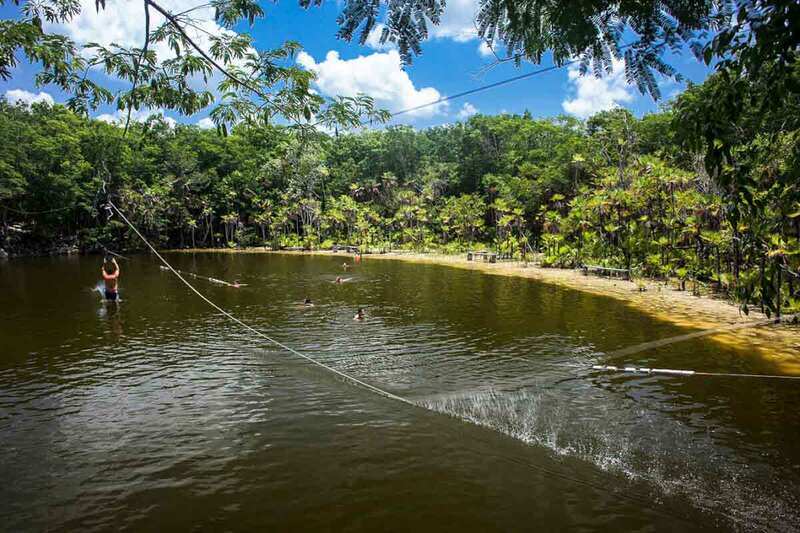 Costs: it varies from 70 pesos (Popul Vu cenote) to 200, more if you do some extra activity.